Our product range includes a wide range of film roll dispenser, wrap film dispenser, packing film dispenser and easy cling film dispenser. We are offering a multipurpose Cling Film Dispenser made of High Quality Food Grade Plastic with International Looks and Aesthetics. General Food protection for Homes, Hotels, Bakery . Suitable for packing of materials for Home Delivery, Picnic, Office. 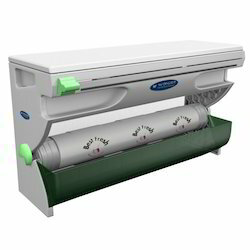 Keeps Cut Fruits and Vegetables Fresh for much longer period. Protect Silver and Brassware from Luster. Protect Pictures, photographs, and memories by thin transparent layer from distortion. It has infinite uses and is suitable for protecting almost all the things from moisture and fungus. With our technically acclaimed and user friendly design of the dispenser, we have firmly positioned ourselves as leading manufacturer and supplier. Our offered dispenser is highly admired for its durability and other related excellent features. Having developed in specifications as per mass requirement and feedback of our value customers, the offered dispenser finds extensive application in all type of industry as well as for domestic purposes. In order to meet all quality standards, our offered panel is tested on various parameters so as to provide a defect-free range at our precious clients' end. From our experience and need of our clients we have developed a dispenser that will find extensive usage in all type of industry as well as for domestic purposes. 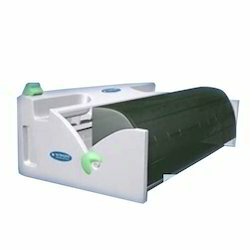 The offered cling Film Dispenser is made of High Quality Food Grade Plastic with International Looks and Aesthetics on latest state of the art machineries with high precision. Looking for Film Dispenser ?